Don’t call it a comeback. Detroit’s renaissance bridges its past and future, the perfect excuse to visit the Motor City. Detroit’s car culture is impossible to ignore. 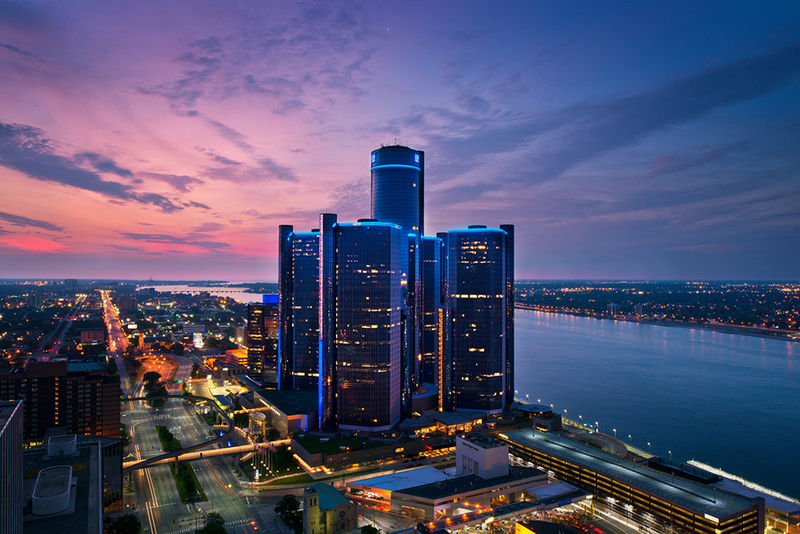 Dubbed the Motor City long ago, it’s home to the headquarters of General Motors, Ford, and Fiat Chrysler, more commonly known as the Big Three. For decades, this auto industry hub represented the American dream—a dream that, in recent years, has been forced to evolve. Cue Detroit’s rebirth of creativity, which pays homage to the city’s history in contemporary ways. Just a block from the Detroit River in the heart of downtown sits the Detroit Foundation Hotel. 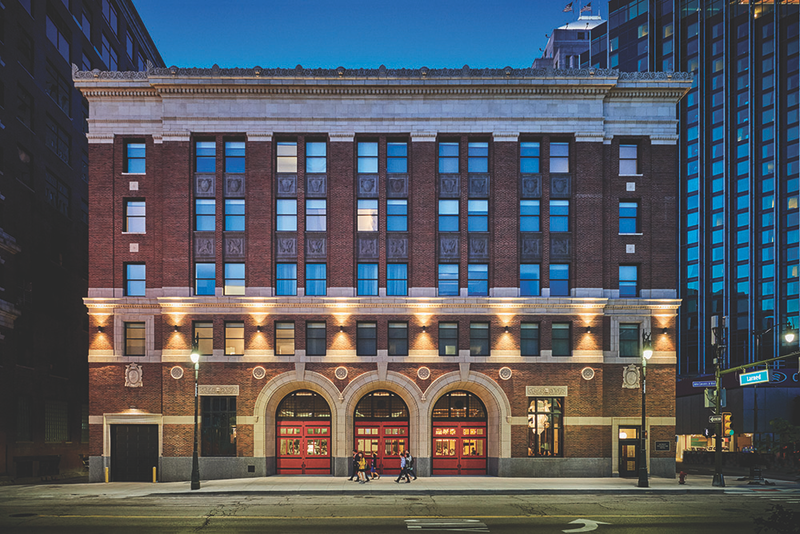 Formerly the Detroit Fire Department headquarters, this chic hotel is a perfect example of the city’s efforts to integrate historic charm with contemporary designs. Owned by Aparium (its boutique hotels, including Hotel Covington, take a localized approach to hospitality), the hotel boasts 100 luxe rooms, curated amenities, and a ground-floor restaurant at the forefront of the city’s dining scene. Through the firehouse’s original doors, the lobby is decked with retail goods from local brands like 1701 Bespoke Detroit and Mills Pharmacy + Apothecary. One-of-kind art installations add to its ambiance, like Detroit artist Kim Harty’s light installation, which floats above the hotel bar where fire hoses once hung. Continue admiring the building’s historic bones in one of its guest rooms, where you’ll find a treasure trove of goodies in the mini-bar stocked with spirits and brews crafted within city limits. 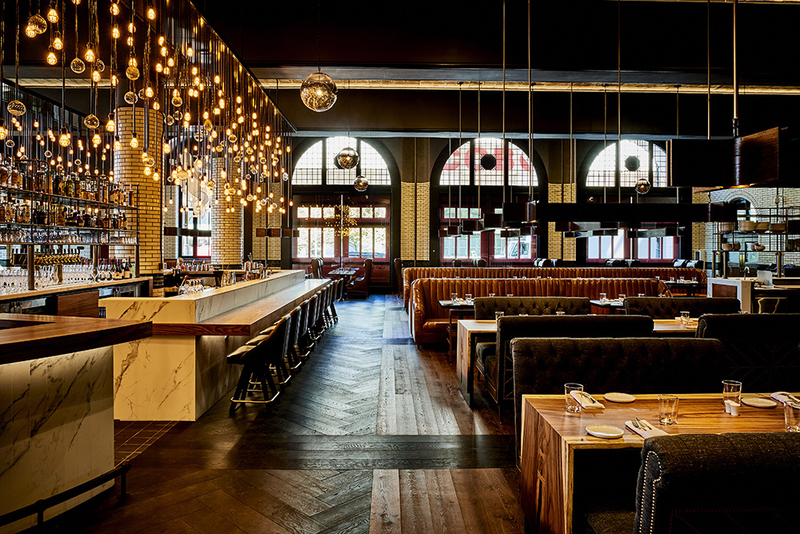 Should you choose to leave your room, you don’t have to travel far to fill your belly with innovative cuisine and top-notch cocktails; the hotel’s restaurant, The Apparatus Room, is located in the firehouse’s former garage. The restaurant is headed by Thomas Lents, a Michigan native, who helped attain two Michelin stars as executive chef at Sixteen, a restaurant in Chicago’s Trump Tower. With breakfast service at 6:30 a.m. daily, and bar bites like french fries with za’atar served well into the evening, you can find something worth the elevator ride day or night. Beyond the hotel’s doors, Detroit’s riverfront beckons. Explore the Detroit Riverwalk, where lush greenery and sprinkling fountains lead you to General Motors’s multi-skyscraper world headquarters, nicknamed the Renaissance Center, which feels like a city within a city. Steps from the riverfront entrance, inside the center’s Wintergarden atrium, gaze at vintage GM cars, like a shark-like 1956 Firebird II, a 1966 Electrovair II, and a classic two-door 1955 Buick Century. Finish your self-guided Renaissance Center tour with a hearty meal at Andiamo, a chic Italian restaurant right on the edge of the center’s atrium. Choose from more than 100 wines to complement authentic Northern Italian dishes, like the made-from-scratch pumpkin gnocchi served with pan-grilled scallops and a butternut squash puree. At dusk, the intimate restaurant offers sparkling riverfront views of Windsor, Ontario. For a taste of Detroit’s past and present, check out West Canfield Street in the historic Cass Corridor neighborhood. 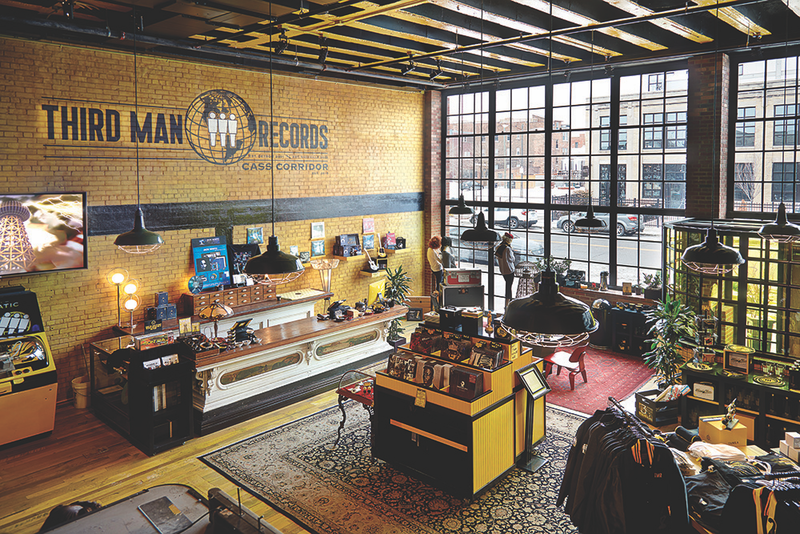 Take in some seriously fresh vinyl—straight from an attached record pressing plant—at Third Man Records, the second retail location of the namesake record label that White Stripes artist Jack White established in 2001. In this part-record-store–part performance-venue, you’ll find rare albums by The Supremes next to live recordings by Father John Misty and The Shins. Across the street sits Detroit’s oldest operating brewery, Motor City Brewing Works, and a few doors down lives Michigan’s first-ever brew-pub, Traffic Jam & Snug. Sink into a well-loved booth at Traffic Jam and sample a flight of uncommon, rotating brews. And don’t forget to try the in-house bakery and dairy treats (hello, small batch ice cream!). Trust us, this 54-year-old pub knows its crafts. It’s easy to get lost in the more than 100 galleries inside the Detroit Institute of Arts, located in Midtown Detroit near Wayne State University. 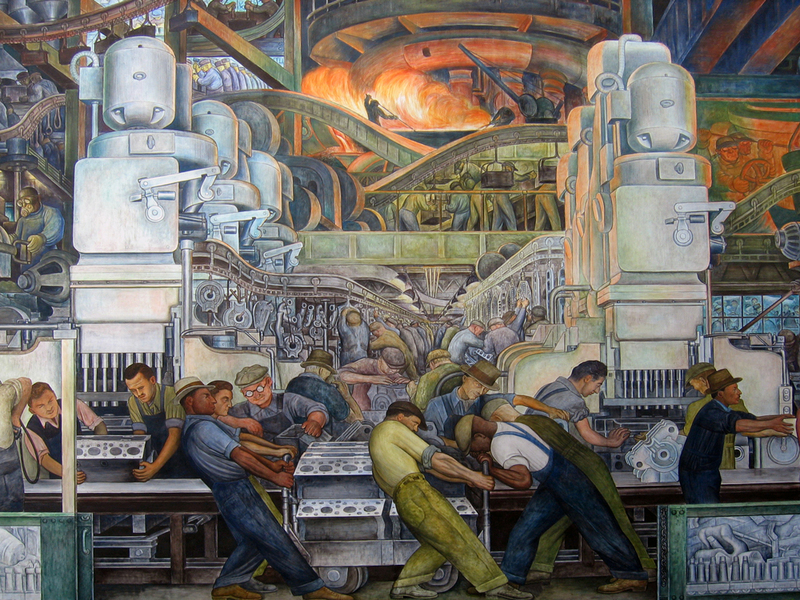 In the main hall, take in what is considered Diego Rivera’s most successful work: the Detroit Industry Murals, which he painted in 1932 and 1933. Spanning 27 fresco panels, Rivera depicts Ford Motor Company factory workers, blasting furnaces, and welding machinery. Rivera’s depiction of the blue collar workers who built the Motor City parallels Union Terminal’s mosaics by Winold Reiss. Like Rivera, Reiss came to the project as an outsider—Rivera from Mexico and Reiss from Germany. Both artists used personal perspectives to portray those who turn the gears to make a city run.